Are your mornings as depressing as ours? You slump into the bathroom and the weighing scales sit there taunting you with what they know; that you're a fatty. Or rather that’s what you think as the numbers on the scales get higher and higher each day. Damn scales. They do it on purpose. They're broken, they must be! 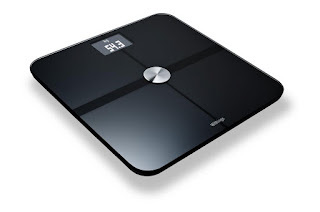 Wouldn't it be nice to have a set of scales that is actively helping you to lose weight? No, not a set strategically placed on the top of Mount Everest which you have to climb to reach - ones like the Withings Smart Body Analyzer. 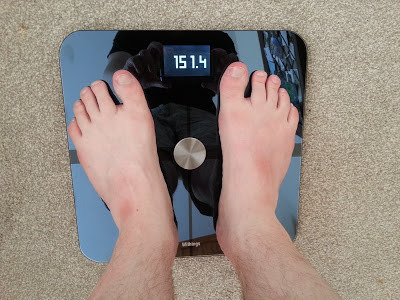 Lets get over the first hurdle shall we: THIS DOES NOT PUBLISH HOW FAT YOU ARE TO FACEBOOK. We thought we needed to make that clear, as it is what we first worried about when we heard of a set of weighing scales with built-in Wifi. Fortunately all the data the Smart Body Analyzer records is kept privately on your phone thanks to the connected free app. Okay? Right, let's move on. At the first appearance the Body Analyzer looks very much like any other high-end digital scale; black, tough tempered glass surface, plastic base feet. When you first step onto it even the LCD display works much like a conventional device and gives you the good or bad news immediately in either pounds or kilograms. 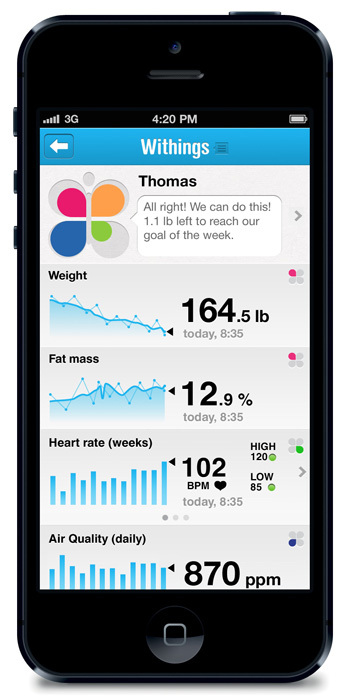 It's when you fire up the Withings app that things start to get impressive. Smoothly laid out (and for both iOS and Android) the app prompts you to create an account, tell it if you are male or female and how old, and then connects to the Body Analyzer. It will ask you to step onto the scales and then will immediately weigh you, measure your heart rate (through your feet!) and also sample the quality of air in the room you are in. All this information will handily appear in the app and be recorded. Its the recordings of data that will truly come in handy. Your weight measurements, for example, are plotted for you in a graph which will run alongside a line of desired weight (which you enter - don't worry, the Body Analyzer won't judge you and order you to lose weight). This makes it much easier to see what weight has been lost through exercise and also to help you achieve your goal. Seeing this - along with heart rate, body fat percentage, air quality and temperature - is actually very reassuring, and if you are trying hard to get fit we can see how the ever growing graph would help. The room air quality measure was slightly an odd thing. Over the course of testing it never varied much at all in different areas of Test Pit HQ. It's there to help you check CO2 levels which, if too high, might effect the quality of your sleep. It was nice to know but we assume it would be more helpful if we lived in a submarine. 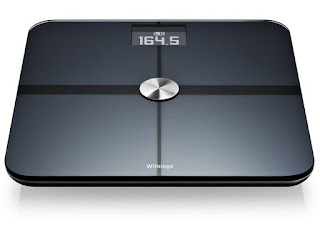 For those in training and wanting to know the specifics of their weight loss, we can imagine the Withings Smart Body Analyzer being the ideal tool. For those just wanting to know their weight... maybe not. Although it fitted into our bathroom seamlessly and certainty appealed to our love of technology, we are not quite sure the price is entirely worth it. Clearly expertly made and cleverly integrated with mobile tech, the Withings Smart Body Analyzer is definitely one for the sporty types amongst us. You know who you are. You're the sweaty ones. Feet! And by the way, those numbers are wrong. Yes, have to be.